I write science fiction and fantasy. I spend far too much time day dreaming about my heroes; whether elf, human or hot starship pilot. And dreaming of ways my heroine can bring them to their knees! 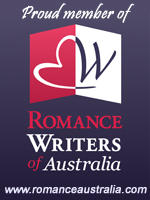 A member of RWA, RWA (Oz) and RWNZ, I am a place-getter in the Australian Emerald Award, the New Zealand Clendon Award in which I also won the Reader's Choice Award, and the Strictly Single. Living in rural Queensland is fantastic fuel for the imagination, my husband and children dragging me away to provide the 'me' time in the real world.